HomeFAQWhat are the differences between the Marine and Climate sea level Products? The retrieval of mesoscale signals in the context of ocean modeling and analysis of the ocean circulation at global or regional scale. This requires the most accurate sea level estimation at each time step with the best spatial sampling of the ocean. Such dataset is produced within the Copernicus Marine Service (CMEMS) (previously distributed by CNES/AVISO). The monitoring of the long-term evolution of the sea level for climate applications and the analysis of Ocean/Climate indicators (such as the global and regional Mean Sea Level evolution). This requires a homogeneous and stable sea level record. Such dataset is produced within the Copernicus Climate Service (C3S). Table: Main characteristics of the CMEMS and C3S DUACS altimeter sea level gridded products. The number of altimeter used in the satellite constellation: all available altimeters are included in the CMEMS products whereas a steady number (two) of altimeters are included in the C3S products (see graph below). The long-term stability is ensured by the reference missions and it may be affected by the introduction of a new satellite. Thus, the stability of the C3S products is improved with a steady constellation. In the CMEMS products, the stability is also ensured by the reference missions and the mesoscale errors are reduced due to the improved ocean surface sampling thanks to the use of all satellites available in the constellation. Similarly as the SL_cci products, the reference used to compute the sea level anomalies is a mean sea surface (MSS) for all missions in the C3S products whereas a mean profile of sea surface heights is used for missions with a repetitive orbit in the CMEMS products. These mean profiles increase the local accuracy of the sea level estimates, but the combined use of both MSS and mean profiles for successive missions in the CMEMS sea level record can be at the origin of some biases affecting the sea level stability. Even if this has a minor impact on a global scale (with respect to the uncertainty on an interannual timescale), the stability of the regional MSL can be affected. 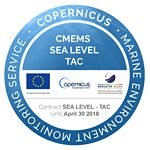 Thus, the systematic use of the MSS for the sea level computation of all missions contributes to ensure the MSL stability in the C3S products and the accuracy of the CMEMS products is increased with the use of the mean profiles for repetitive missions.